The Folsom Cash Art Trail is one of Northern California’s many beautiful hike and bike trails- but it’s also so much more than that. The trail is an interactive art experience which uses smartphone apps and 8 monumental art pieces to tell the story of Johnny Cash, the legendary singer who made Folsom Prison famous. These 8 sculptures were designed by Romo Studios LLC of Sacramento and the Fine Art Studio of Rotblatt-Amrany in Illinois. Creating the art for this trail was a unique challenge, one that all of the artists met with spectacular success. Adan Romo of Romo Studios spoke to this challenge, stating “there was a real danger of making it a Disney-type experiment... It’s a sensitive subject as you’ve got the prison, the music, Johnny Cash’s legacy…” The artists have met the challenge head-on, and the 8 art pieces pay tribute to the singer’s legacy and the history of the prison with sensitivity and grace. Can’t wait to take a hike down the Johnny Cash Art Trail? Here’s a behind-the-scenes glimpse at the artwork and the inspiration behind each piece. The Johnny Cash Trail is earning a lot of attention, from art fans, trail lovers, history buffs and (of course) fans of the Man in Black. The art trail experience is scheduled to be completed by the end of 2017, but you don’t have to wait that long for a preview of the breathtaking art pieces that will be found along the trail. Here’s a sneak preview of the art of the Johnny Cash Trail Art Experience. The first piece on the trail is a 7-foot tall bronze guitar pick sculpture, which serves as a reminder of the music that started it all. When artist Adan Romo of Romo Studios visited the land where his pieces would go, he observed that the trail had a rhythm to it, like a song. Cash started his songs by simply taking a pick to his guitar, and Romo wanted to start the trail the same way. There will be two picks, one at each end of the trail- so wherever you start and end your journey, you’ll begin with Cash’s pick. This piece by Romo Studios appears to be a set of 15-foot laser cut steel bars. If you rush past, you may only perceive this piece as a set of bars resembling prison bars. Don’t be too hasty- if you approach from just the right angle, there’s a surprise waiting for you. The laser cut bars actually depict a moment from the Folsom Prison performance transformed Cash professionally and personally. It launched his career and solidified his role as an advocate for prisoners everywhere. The recording of the album At Folsom Prison made the man into a superstar. This piece is a magnificent homage to that moment. The Ring of Fire is set on a ledge, 70-feet above the street below. It looks down over the city, Folsom Prison, Folsom Dam, and the Sacramento Valley. This awe-inspiring sculpture appears to be a burning steel ring from a distance. However, those on the trail passing 20 feet beneath the sculpture will see that the ring is actually composed of enormous guitar picks arranged into a 12-foot-high circle, illuminated by LED lights. This sculpture pays tribute to one of Cash’s best-known songs, but it also serves as an homage to his passion as a musician, husband, father, and humanitarian. 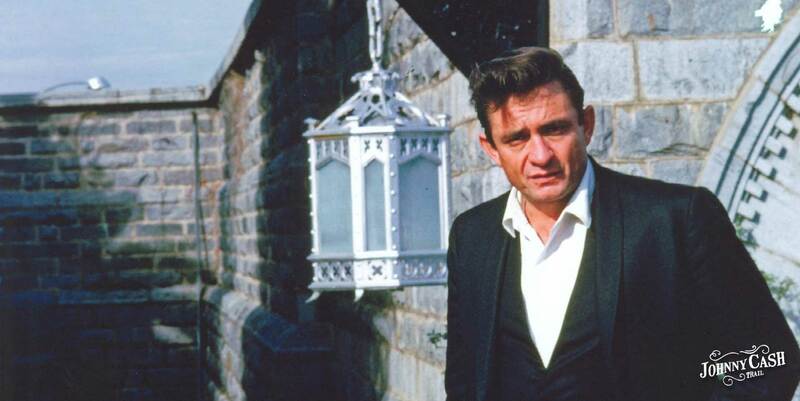 Johnny Cash performed for incarcerated men throughout the 50s and into the 60s. He was passionate about speaking for prison reform and bringing hope to the incarcerated. Two of the prisoners who saw him perform even went on to have country music careers themselves. Johnny Cash performed at San Quentin, and one inmate found his performance particularly inspiring. Legend has it that when Merle Haggard watched Cash perform, it was the turning point that turned the country star from a life of crime into a well-respected country music artist. Another future country musician, Glen Sherley, was among the inmates who saw Cash’s legendary performance at Folsom Prison. This performance had a special significance for Sherley. Cash was presented with a song that Sherley wrote called Greystone Chapel. Cash read Sherley’s song two days before his performance, and was so moved that he took it upon himself to learn it and play it for the inmates. Romo Studios’ sculpture “Greystone Chapel” pays tribute to inmates like Haggard and Sherley who were touched by Cash’s performances. It’s built from granite blocks from the walls of the prison itself, which are set with metal plaques. Each plaque is inscribed with a message from one of the many prisoners who wrote to Cash after his historic performance in Folsom. The fourth track on the legacy edition of the album At Folsom Prison lets listeners experience Cash’s unforgettable introduction on the morning of January 13th, 1968. This seven foot statue pays homage to Cash’s humble introduction. The sculpture shows Cash seated on a stool, with his guitar on his lap and one arm draped across the body of the instrument. The larger than life, 7-foot tall sculpture will be situated in front of the prison gates, where Cash posed for a picture decades earlier. This title of this piece, also by Romo Studios, refers to the song Rusty Cage, which Johnny Cash covered on his Grammy-winning album Unchained. The sculpture is composed of statues of the necks of three Martin D-35 guitars, each standing 17 feet tall and 3 feet wide. The three guitar necks are situated in the exact shape and dimensions of a Folsom Prison jail cell, atop a hill overlooking Folsom Lake. Visitors looking out from between the rusty cables that form the guitars’ strings will have the experience of seeing the beautiful scenery of the Sacramento Valley, just out of reach between the bars. This 40-foot statue by Gary Tillery of Rotblatt-Amrany Studios will overlook the 3-acre Johnny Cash Legacy Park and amphitheater. The statue will stand atop a 10-foot high granite base, and feature flame cutouts in the musicians trademark black suit. When the artist first envisioned the sculpture, he saw Johnny Cash, larger than life, looking away from the intersection of East Natoma Street and Folsom Lake Crossing, looking back towards the prison that would help shape his career. When the sun sets, the statue will appear to burst into flames. This monumental statue is the perfect tribute to Cash’s passion for prison reform and prisoners’ rights, and his lifelong role as a voice for the underdog. As you leave the trail, Romo Studios’ second guitar pick sculpture will bid you goodbye. This encore appearance of the first sculpture on the trail, Johnny Cash’s Pick, brings your journey full-circle. It reminds visitors of the humble man, seated on his stool, with just a guitar and a pick. The Folsom Cash Art Trail experience will delight country music fans, art lovers, long-time Folsom residents, and tourists alike. The artwork along the trail will allow visitors to share in some of the most inspiring moments of Johnny Cash’s career. With this artwork, the City of Folsom pays tribute to a passionate and caring humanitarian, and legendary musician.